Welcome to traditional Chinese massage institutes by Lanqi! Our three Chinese massage institutes welcome you for your beauty and well-being. 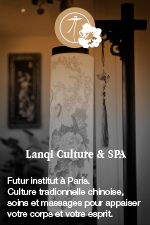 Traditional Chinese massage salons Lanqi are located in Paris 15ème, Paris 7th and Neuilly. As for the new Lanqi Spa, is located in the heart of the 7th district with its 270 m2 dedicated to the body and mind well-being several levels with a herbal tea room. A nice lounge for beautiful hands, a floor dedicated to women with 10 cabins and another floor with 6 cabins only for men. Bio herbal tea coffee shop to enjoy herbal teas and complete your relaxing journey. The West is becoming increasingly aware of the importance of personal care on well-being. 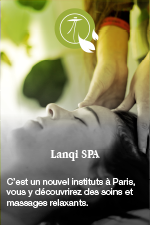 Since 2002, Lanqi imported from Beijing to Paris, the Chinese expertise in the art of massage. Lanqi has indeed inherited the ancestral art for three generations; her great-uncle went from village to village to relieve population with massages and medicinal plants. They are family secrets and transmitted to the masseuses of the three lounges, all graduates of traditional Chinese medicine. All massages are performed with the “TUINA” technique: The TUINA practiced for over two thousand years, the mainstay of Chinese medicine, the principle toning the body and its functions as a whole (physical, mental and emotional). Teams Lanqi guarantee you a boost of energy and inner vitality recovered.